I finished this Noro Kureyon scarf a day or so ago. It was a fun little project. I got the pattern from one of the local LYS's in Fredericksburg. This pattern is reversible and easily memorized which made for great in front of the television knitting. I'm with you on lovin the Noro Kureyon. 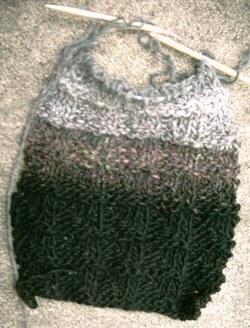 It's awsome, I'm making another mulit-directional scarf with it. Like makin hats with it too. Hi, nice very nice page..!